Visit a medieval cathedral, and chances are that you will come across a Labyrinth, either laid into the floor as in Chartres, or among the artwork and stonemasonry. The Labyrinth has been used for centuries as an aid to prayer and meditation, helping to centre yourself and focus thoughts. Measuring about thirty feet across, our Labyrinth is robustly constructed from strong canvas, making it suitable for use inside or out. It come with pegs and guys, allowing it to be firmly fixed in place on a grass surface. “Thought stations” can be located at different points along the path as well as in the space at the centre. We are currently putting together a booklet of ideas and thoughts on how to make it meaningful and accessible for schoolchildren. A “visitors book” will also accompany it, where we would welcome your thoughts, ideas and feedback. 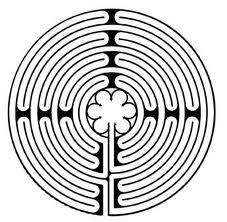 If you wish to use the Labyrinth in your school, or to discuss how to use it, please email the education team.